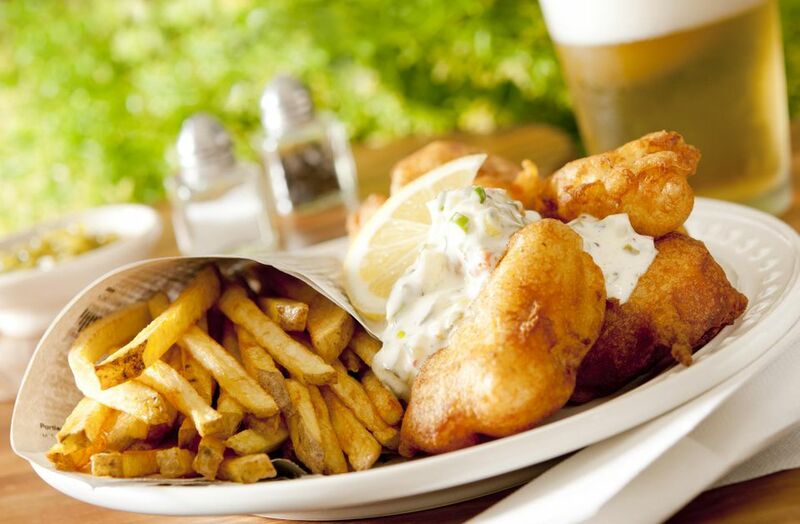 This is a quick and easy recipe for a beer batter that goes great with nearly any fish or seafood; it's basically a fish 'n' chips batter made with a good beer, flour and a little oil. The keys here are cold batter, hot oil and quality fish. This recipe works well with tilapia, cod, haddock, walleye, sea bass, snapper, halibut -- just about any firm fish. You can even use it for shrimp, calamari or oysters. Serve this with french fries and a dipping sauce. I like ​simple mustard. This recipe makes enough batter for 2 pounds of fish or seafood. Mix the flour, olive oil, salt and beer together in a bowl. Add the beer last and do it slowly, stirring all the time. You want enough beer in the batter to make it the consistency of house paint or pancake batter. Put the batter in the fridge for 20 minutes. After 10 minutes, take out the fish and salt it liberally. Let it sit on the counter for 5 minutes or so, then slice it into pieces about the size of a large shrimp. Heat the oil to 350 degrees F. I use canola oil, but any vegetable oil will do. When the oil is hot, dredge the fish into the batter and coat it thickly. Gently place it in the oil and repeat. Do not crowd the pot or deep-fryer; do this in several batches. Fry until the fish is golden brown, moving it around the oil so it does not stick anywhere. This takes about 5 to 8 minutes. Serve at once with a sauce (tartar sauce, cocktail sauce, mustard, hot sauce, ketchup) and an ice cold beer.